The Metro Cartel presents Duck Lo & B.I.G. 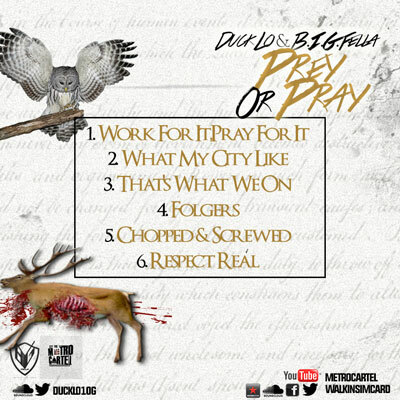 Fella who have collaborated to deliver their 6-track project “Prey or Pray”. Like most rap that I listen to, ranging from gangster rap like Chief Keef and Waka to Blu, Fashawn, and other so-called “socially conscious” artists like Mos Def, the one thing I find that’s most important is voice and passion. I feel that is exactly what Duck Lo & B.I.G. Fella deliver on this mixtape. Every word is delivered with precision to the vibe-center of your brain. Duck Lo & B.I.G. Fella put out great verses and incredible production here. Many times, concepts and subject matter in underground hip-hop get cycled around, though that is not the case for this mixtape, as the two DMV artists brings a lot of new perceptions and insight to topics new and old. Duck Lo & B.I.G. Fella perform with very directional lyrics and a lot of imagery. The more I hear the mixtape, the more I groove to it and enjoy myself. Especially on tracks like “Work For It, Pray For It”, “What My City Like” and “Folgers”. These dudes are pro and I would have been glad to pay top dollar for their music. What I need in Hip Hop, is actual lyrics and not too much explicit language. Duck Lo & B.I.G. Fella hit a comfortable balance here. You also never have to worry about getting stuck with a mixtape full of songs that all sound the same. Firstly because the mixtape is compact and concise with its 6 tracks, and moreover there is variety in its topics and sound. “Prey or Pray” is a remarkable blend of lyrical depth, complexity, soul, and beauty, without exceeding in either direction. Duck Lo & B.I.G. Fella and crew, stay fresh and productive on the boards and the mic. 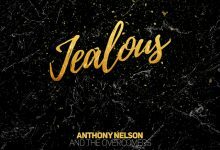 Producers and rappers with the level of talent, as showcased on this mixtape, is an increasingly rare thing in hip-hop these days, and these in particular are among the best in the underground business. Not having heard previous material, I’m not sure if “Prey or Pray” is the group’s best work to date. It took a couple listens to wrap my mind around it (like it should with all really good music), but once the absolutely beauty and complexity of this mixtape hits you, it becomes hypnotizing. 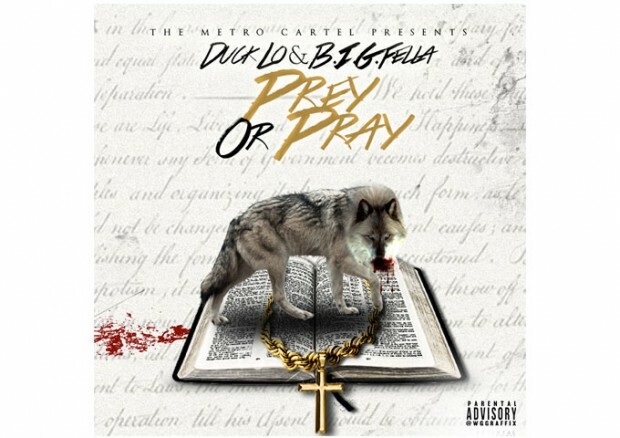 “Prey or Pray” gives me reason to appreciate Duck Lo & B.I.G. Fella, both for the incredible music they make, and for what they want to represents in the DMV hip-hop world! Malimal: “Sept.Ember” showcases his best rapping skills!